Dynaudio has a repertoire of high-end, traditional "box" speakers for the home. By buying this product you'll earn up to 700 Rewards points. Dynaudio has a repertoire of high-end, traditional "box" speakers for the home. But they also have cool "problem-solver" models too, like the in-ceiling S4-DVC65. 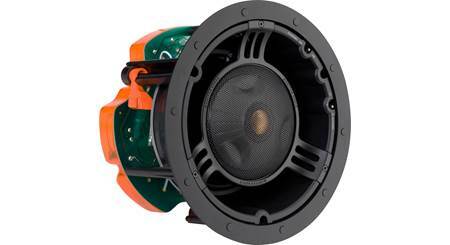 This stereo-input speaker uses a dual-tweeter, dual-voice-coil design, so it can play both channels of a stereo signal all by itself. It's perfect for kitchens, small bedrooms, or any other room that you want music from a single in-ceiling location. Dynaudio's dual-tweeter design reproduces both the left and right channels of your stereo music sources with a single speaker. 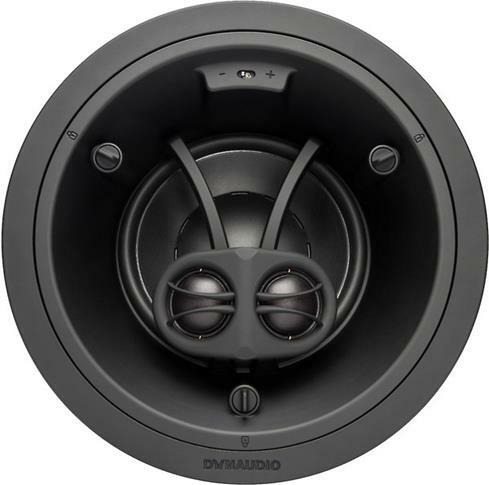 The S4-DVC65's uses two 1-1/8" soft dome tweeters and Dynaudio's 6-1/2" MSP (Magnesium Silicate Polymer) woofer for natural, full-range sound. These drivers are angled at 18° — and each tweeter is independently adjustable — so you can aim them wherever you want for the best sound. 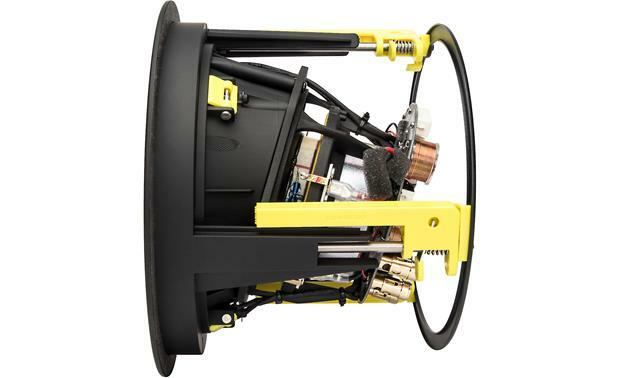 You can also rotate this speaker 360° in its frame. If you rearrange your décor down the road, you can easily change the direction your speaker fires. The S4-DVC65 is most commonly used as a traditional stereo-input speaker for music. You can toggle between "stereo" and "mono" modes for system-building flexibility. There's also a rear-panel switch which lets you change it to "dipole mode" for use as a surround sound speaker. This setting puts the tweeters out of phase with each other, giving you a diffuse soundfield — perfect for immersive sound effects. Mix and match Dynaudio Architectural Studio Series speakers for voice-matched sound. 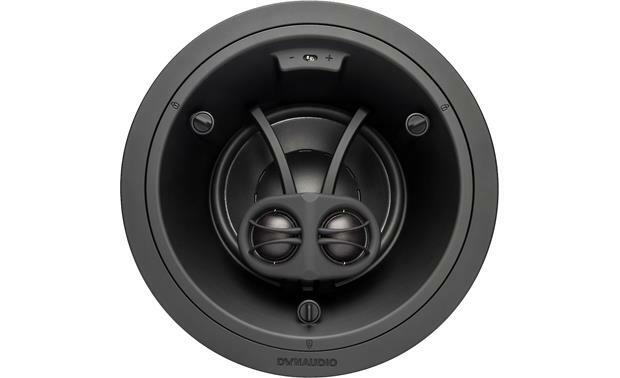 In-Ceiling Dual Voice-Coil Loudspeaker: The S4-DVC65 in-ceiling speaker incorporates twin 1" precision-coated soft-dome tweeters and one dual voice-coil 6.5" MSP mid-bass driver that enable it to reproduce both channels of stereo program material. 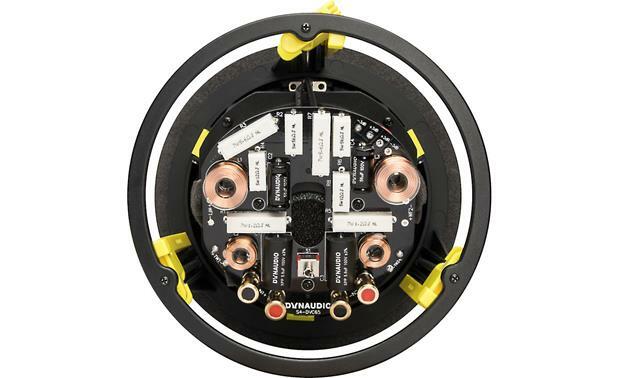 The twin tweeters of the S4-DVC65 can also be switched to opposite polarity to enable its use as a dipole mode surround speaker in multichannel home theater installations. When used in dipole mode the S4-DVC65 should be connected to only one amplifier channel. Angle & Level Adjustment: The Studio Series in-ceiling loudspeaker incorporates an 18° angled, 360° rotatable mid-bass driver; and 3-position, dual adjustable tilt tweeters to enable its acoustic directivity to be optimized for the installation arrangement and acoustic character of the listening room. In addition, the high frequency tonal balance of the Studio Series speaker can be adjusted to suit different installation environments. 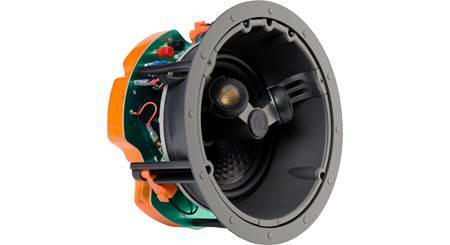 A tweeter level switch located on the speaker's front panel offers 0 dB and -3 dB options. The level adjustment operates from approximately 3kHz and upwards. Spring-Post Terminals: The Dynaudio Custom Architectural Studio Series S4-DVC65 is equipped with two sets of spring-post terminals for connection of your receiver's or integrated amplifier's left and right channel outputs. The spring-post terminals will accept bare wire (up to 12AWG), pin-connectors, or banana plugs (single or dual). 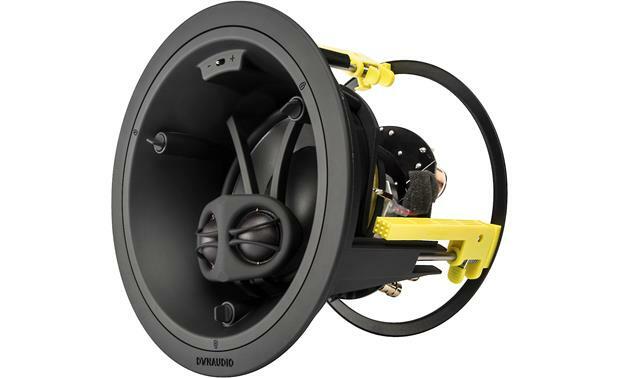 Mounting & Installation Options: The Dynaudio S4-DVC65 speaker comprises of a Speaker Unit and Installation Frame. The Installation Frame is inserted into the ceiling cut-out (8.3125"Diameter x 6.625"Depth) and is securely fixed in place using auto-locking clamps (there needs to be 1.125" of clearance around the cutout for the clamps to rotate and engage). 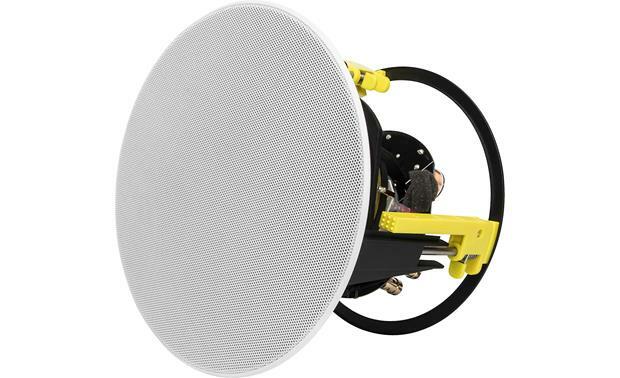 The Speaker Unit is then connected to your speaker wire before being inserted into the Installation Frame to be held in place by a latch system. 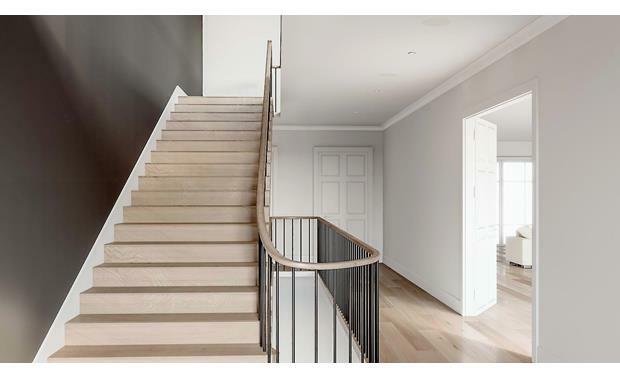 Drywall or plasterboard thickness must be 0.3125" (minimum) to 1.875" (maximum). Applications & Placement: The Dynaudio Custom Architectural Studio Series S4-DVC65 can be used in a distributed audio, 2ch stereo, or 5.1ch/7.1ch/9.1ch multichannel home theater application (including Dolby Atmos installations). 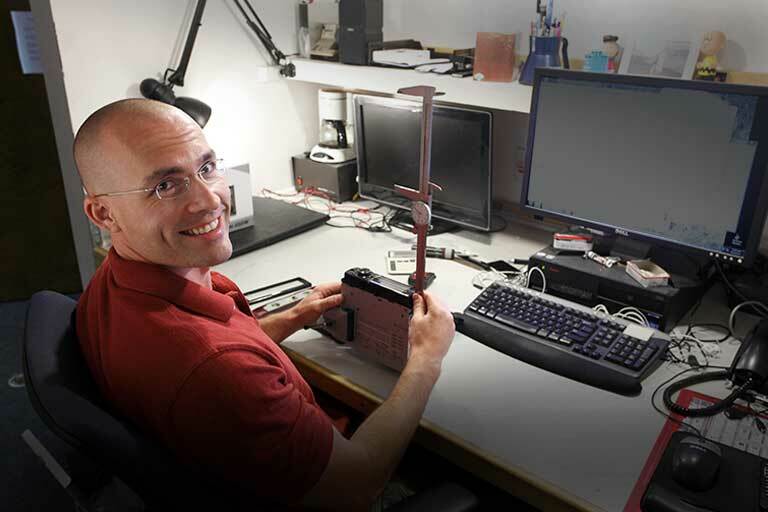 Follow these placement guidelines based on your application. 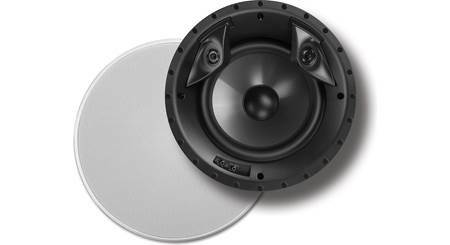 Distributed Audio: The S4-DVC65 in-ceiling speaker is particularly suited to background sound applications as it can play stereo audio from a single unit. If one or more Studio Series speakers are required simply to provide mono background audio, they can be located essentially as dictated by coverage, convenience and architecture. The primary acoustic constraint to consider is that corner positions are likely to result in bass emphasis. Stereo Audio: The S4-DVC65 in-ceiling speaker can be used to reproduce stereo audio thanks to its twin tweeter and dual voice-coil format. If a pair of Studio Series in-ceiling speakers are required for stereo audio reproduction, they should ideally be located between 10' and 16.5' apart and a similar distance from the listening area. The acoustic environment around each speaker and distance from each one to adjacent walls should ideally be similar. Aim to avoid corner positions for either speaker. 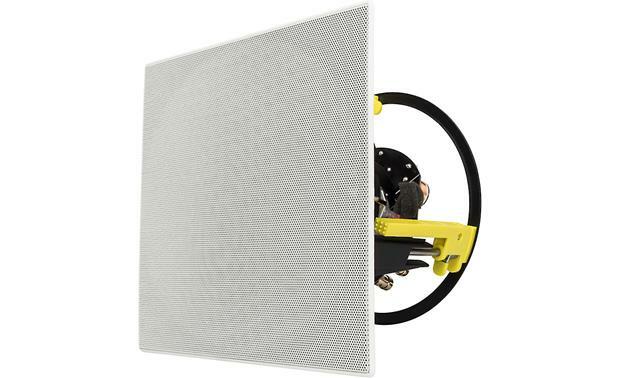 Multichannel Audio (Dipole Mode): The S4-DVC65 in-ceiling speaker can be used in Dipole mode for surround channel applications. In Dipole mode the twin tweeters of the S4-DVC65 are connected in opposite polarity so that a high frequency acoustic null is generated on the unit's centrally forward axis. The S4-DVC65 units used in Dipole mode should have their mid-bass driver rotated and the tweeter angle adjusted so that they are orientated towards the listening position. Surround channel speakers should be located just behind and at either side of the listening position. 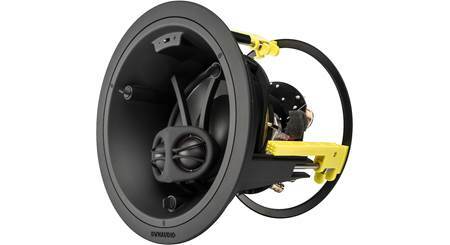 Searches related to the Dynaudio S4-DVC65 In-ceiling stereo-input speaker with dipole surround sound mode.